The lack of sufficient and impartial media coverage, as well as international attention, is one of the contributing factors fueling Indonesia’s crackdown in West Papua. Despite the alarming number of Papuans killed throughout the five decades of conflict [between 100,000 and 500,000 people], the situation of West Papuans remains underreported by national and international media, especially since Indonesian authorities systematically deny journalists permits to cover the situation in the region. Now more than ever, say activists, media access to West Papua is crucial in order to bring global attention to a planned smelter, and to give the world a true understanding of the human rights situation in the region. It is a region rich in natural resources, the biggest source of tax revenue for the fourth most populous country in the world and, under de-facto military rule - it is also a place where activists are jailed, tortured, disappeared and assassinated. So why doesn’t the world know more about West Papua? Quite simply, because Indonesia’s restive, easternmost region is home to “one of the least covered armed conflicts in the world,” says Bob Dietz, Asia-Pacific director for the Committee to Protect Journalists (CPJ), of the more than 50-year conflict. Four decades of heavy restrictions on media and human rights groups’ access to West Papua has resulted in a near media blackout. Linked to all this is a United States-based mining giant, Freeport-McMoRan. Though its Phoenix, Arizona, headquarters is almost 15,000 kilometres away from the Indonesian capital of Jakarta, it is the country’s largest taxpayer. In 2014, Freeport contributed a massive US$1.5 billion to the Indonesian state coffers. Not surprisingly, a huge percentage of its profits and revenue depends on its Papua operations – and this has wider implications. “Freeport needs a lot of government security support to operate,” says Andreas Harsono, Indonesia researcher with Human Rights Watch. “I like to joke that even if Jesus Christ wanted to visit [West] Papua, I don’t think he would get a permit,” says Harsono, noting that official permission requires signatures from 18 separate ministries and security agencies – an impossible task. It has, at various times, been controlled by Germany, The Netherlands and Australia, before it was annexed by Indonesia in 1969 in a military-run election in which about 1000 hand-picked representatives were forced to vote for ascension. “Suharto was a brutal dictator who savagely treated Papuans like animals and ordered many bombings and massacres in West Papua,” says Benny Wenda, leader of the Free West Papua. 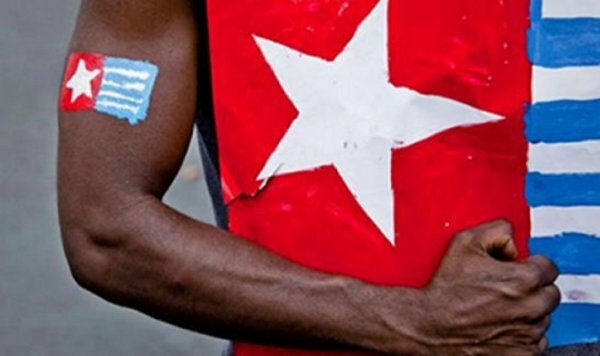 “It looked as though an independence referendum was imminent but the new Indonesian government became incredibly scared of losing West Papua,” says Wenda. “Indonesia’s in-country migration is coming close to making Papuans a minority in their traditional homeland,” says Dietz. Despite the news of police killing four protesters ilast December, many Indonesians remain silent on their government’s occupation of a minority, mostly non-Islamic people who have been waging a low-level insurgency for freedom and justice. “The problem is most people choose not to do anything about it, while some others believe that nothing can be done,” says Samudra. A case in point: the planned new smelter, to be operated by Freeport and an Indonesian partner, will be built on traditional Kamoro lands in the Arafura coast, south of Freeport’s existing mining operations in the region. “Indonesia’s leaders appear determined not to lose another part of its far-flung archipelago by having troublesome reporters, international or Indonesian, expose what is happening in Papua,” says Dietz.